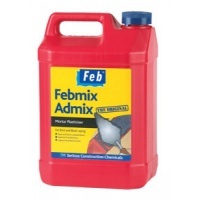 Febmix Admix is the Original vinsol resin air entraining plasticiser that replaces lime in the mix to provide an easy to work “butter like” consistency to the mortar and to prevent shrinkage, cracking and crazing during the setting process. For use in brick laying and plastering mortars. Provides a degree of frost resistance and long term resistance to freeze-thaw cycles when set. Conforms fully with the requirements of BS EN 934-3:2009.